A Turkish educator in Mongolia was briefly abducted on Friday, in what appeared to be the latest episode of a global campaign by Turkeyâ€™s president to capture suspected allies of the exiled cleric accused of plotting a 2016 coup attempt. The educator, Veysel Akcay, runs a network of international schools that has been associated with the exiled Turkish preacher Fethullah Gulen. President Recep Tayyip Erdogan, who blames Mr. Gulen for the failed coup, hasÂ purged tens of thousands of suspected Gulen supportersÂ from government and military posts, andÂ seized dozens of people from abroad. Turkey has maintained that it extradites suspected Gulenists only with the permission of the foreign governments concerned. But the case of Mr. Akcay, who has lived in Mongolia for nearly 25 years, appears to cast doubt on that claim. Mr. Akcay was near his apartment building in the capital, Ulan Bator, on Friday morning when he was bundled into a Toyota minivan, according to a colleague, Ganbat Batbuyan, who was in communication with the Mongolian police. That account was corroborated by two other people, including another colleague and a senior Mongolian official, who spoke on condition of anonymity because they were not authorized to discuss the case. Mr. Ganbat, the Mongolian general director of the Empathy foundation, which runs the Mongolia-Turkish schools, said the Mongolian police told him that the vehicle had a fake license plate and that three masked people were inside. 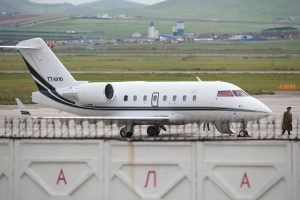 Several hours later, what the Mongolian Ministry of Foreign Affairs described as a Turkish-chartered aircraft landed at Ulan Batorâ€™s airport. It was a Bombardier jet with a call sign matching that of a plane operated by the Turkish Air Force, according to an online flight-tracking service, Flightradar24. As word leaked out about the aircraft on Friday afternoon, Mr. Akcayâ€™s friends and family congregated at the airport. The jet left before 9:15 p.m., without Mr. Akcay on board. He was released several hours later, officials said. In April, Bekir Bozdag, Turkeyâ€™s deputy prime minister, said in a television interview thatÂ Turkish intelligence operatives in 18 countries, including Kosovo and Malaysia, had seized dozens of Turks suspected of having links to Mr. Gulen and taken them back to Turkey. Mr. Erdoganâ€™s government has pressured foreign countries to shutter schools that it says are allied with the spiritual movement of Mr. Gulen, who now lives in Pennsylvania and has denied involvement in the attempted coup. The same year, Turkish diplomats attempted to do the same with the educational network now run by Mr. Akcay, according to his colleagues. The Turkish government accused six Turkish citizens who were deported from Kosovo on March 29, of having connections to Mr. Gulen, whose Islamic movement has garnered support in the Balkans, among other places. Kosovoâ€™s prime minister, Ramush Haradinaj, said that he had not authorized the deportations, andÂ fired his interior minister and secret service chiefÂ on the grounds that they had known about the operation and failed to inform him in advance. This month, Mr. Erdoganâ€™s son visited Mongolia and met with high-level officials, according to a post on the Turkish Embassyâ€™s Facebook page. Turkeyâ€™s Foreign Ministry did not immediately respond to requests for comment. For their part, Mr. Akcayâ€™s friends and family said that the fast response of Mongolian authorities underscored the relative openness of the countryâ€™s political system. The post Turkish school leader abducted, and released, in Mongolia appeared first on Citi Newsroom.